Ibrox Noise: Has Steven Gerrard found a new "Clint Hill" for Rangers? Has Steven Gerrard found a new "Clint Hill" for Rangers? After the major disappointment of failing to sign veteran Slovakian international centre half Martin Skrtel, due to transfer and wage differences, Steven Gerrard immediately had to look elsewhere for an experienced no-nonsense defensive recruitment. The “Gers are reportedly looking to bring 34-year-old veteran James Collins, the Welsh internationalist defender to the Govan club. He has surprisingly become a free transfer target from West Ham and is their second longest-serving first-team player behind captain Mark Noble. James is truly a fans' favourite known lovingly as either The Ginge or The Ginger Pele by the Claret and Blue Army and perhaps he will be joining our Blue and White Army at Ibrox. The 6’ 2” central defender ended season 2016-17 with 199 Hammers appearances to his name over two spells - the first between 2006-09 and the second from summer 2012 onwards. Newport-born Collins represented his native Wales at every level, helping his country to reach the semi-finals of UEFA Euro 2016, before retiring after winning 51 caps from international football in November 2017. By attempting to bring in Collins, does this suggest that Stevie is not convinced he should keep Bruno Alves at the light blues, with a year of his contract still to run? I have read that some of the ‘Gers support do not fancy the idea of wasting money on Collins’s wages, but with no transfer fee involved and 13 years of EPL experience under his belt, he could be a better signing than some folk are giving him credit for. Collins is a no-nonsense leader at the back and is a hard tackling defender that plays the game in an old fashioned safety first way. He does dominate in the air, and wins more than his fair share of his aerial battles at both ends of the pitch. The Welshman has a decent goal-scoring record for a defensive player and Gerrard is looking for more voices of authority in his side and Collins does fit that mould. Collins was loved by the West Ham faithful and he was informed via email earlier this month that his contract would not be renewed. Many of them are really angry at his sudden release, especially with the poor way the London club handled the whole situation. 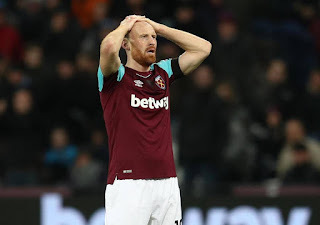 Hammers captain Mark Noble went a step further stating that the club should have offered Collins the loyal, brave, honest and one of the hardest working people you will ever meet, a new deal. The captain and fans have tweeted that West Ham United have truly been lucky to have had him at the club for so long. That shows you the standing the big centre-half had earned himself with his former club’s players and fans. James Collins has endured some problems with hamstring injuries during his career and he does turn 35 in August. It would be a similar signing to Clint Hill a few seasons back and the veteran became one of the top performers of 2016-17. It would also be important for Gerrard to bring in a younger long-term quality defender to add competition at the back. One with height, pace and who can tackle, as that would complement Collins’ or Alves’ style of play. When determining James Collins and his suitability in playing for Steven Gerrard at Ibrox, for me it also comes down to the future of Bruno Alves. I think they’re too similar and of the same age group to play together at the back and if Bruno leaves in the summer, then it is highly probable that Collins could do a job for the SPL side. Not for me unless its a cheap 1 year option. Alves will leave for sure I hope !! We should still be looking to get in a more experience younger CH player with potential. Get him signed. Solid experienced defender playing premiership football. the west ham fans reaction to him leaving says it all. The names getting banded about is quite ridiculous. I will await till the management are put in place and the new players have actually signed. What I will say, we need an overhaul! If you think Gerrard is some sort of magician that will sprinkle the current crop of duds with magic dust and they will all become league winners, they you would be very much mistaken. Signing McGregor is a backward step. We need 3 experience, quality, tall, strong and skilful centre halves, but not ancient pension toppers! I am not convinced and will not be sidewinded with Gerrards name! He is an inexperienced manager and we are taken a huge gamble. If he only signs average players like Warbuton and Pedro signed, then we will be fighting for 3rd place again next season, mark my words!! I will await them managements arrival and see what signings they bring, but the signings you are banding about thus far, are just not Rangers class and will not deliver the league!